Following the triumphant sold-out show at the Birmingham Genting Arena earlier this year, Kennedy Street and Kilimanjaro are pleased to announce Ritchie Blackmore’s Rainbow will be returning to tour the UK in June 2017. The very special opening night will see them headlining the second annual Stone Free Festival at The O2, London, which will be Blackmore’s first London show since 1995 with further shows in Manchester, Glasgow and Birmingham. 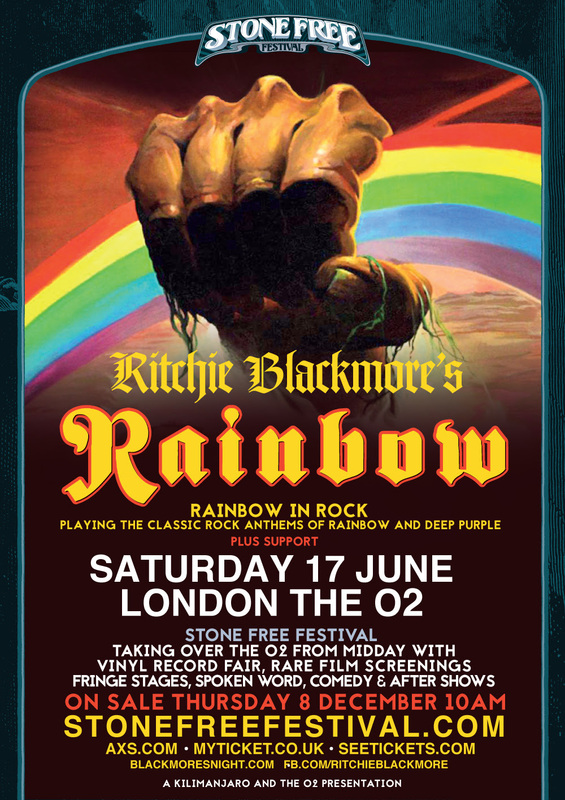 Starting the UK tour at The O2 in London, promoters Kilimanjaro & The O2 are delighted to be able to announce Ritchie Blackmore’s Rainbow will be the headline act for the 2017 Stone Free Festival. Following the hugely successful and highly acclaimed inaugural Stone Free Festival in June this year – which featured electrifying performances from the likes of Alice Cooper, Rick Wakeman, The Darkness, Marillion and many more – the festival returns with even more stages next year, utilising the full array of facilities at The O2 including the Brooklyn Bowl. It will again feature a full line-up of artists and events such as the Speakeasy Lounge and the vinyl fair, alongside special acoustic performances, cinema screenings and exclusive after parties. Further details regarding the line-up of Stone Free Festival 2017 will be revealed in due course.